Welcome to this little blog and our home! It's been a busy few months around here, but our halls have been decked and our lights have been strung, and we are enjoying unseasonably warm temps here in Kansas City! I'll take it! I am so pleased to be participating in this Christmas Home Tour with so many talented bloggers. A huge thank you to Marty from A Stroll Thru Life for organizing. 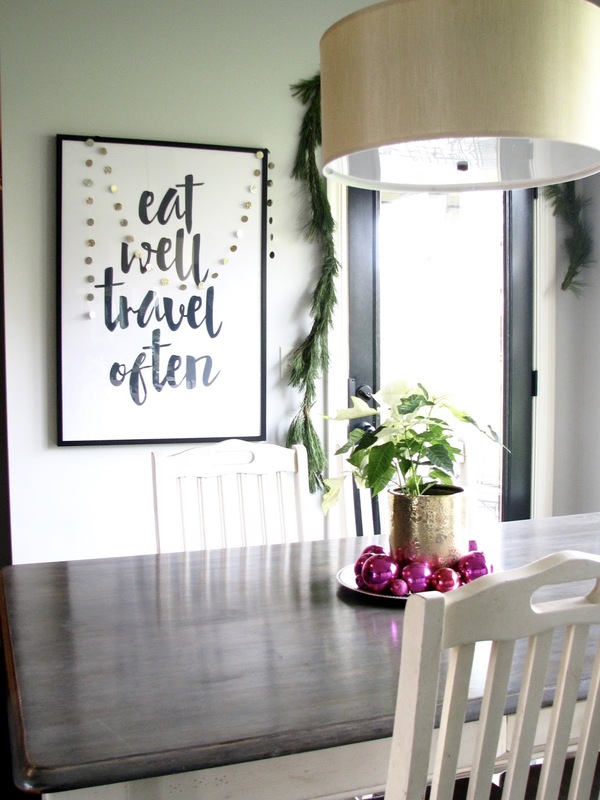 The tour left off yesterday with Sherry from No Minimalist Here and you can find links to all the home tours at the bottom of this post! 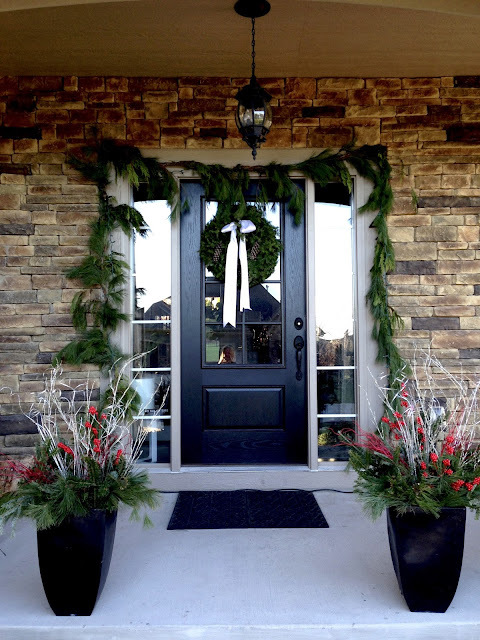 We installed a new front door this year (my favorite upgrade of the year), and it looks especially great with fresh garland around it! Can you find me?! 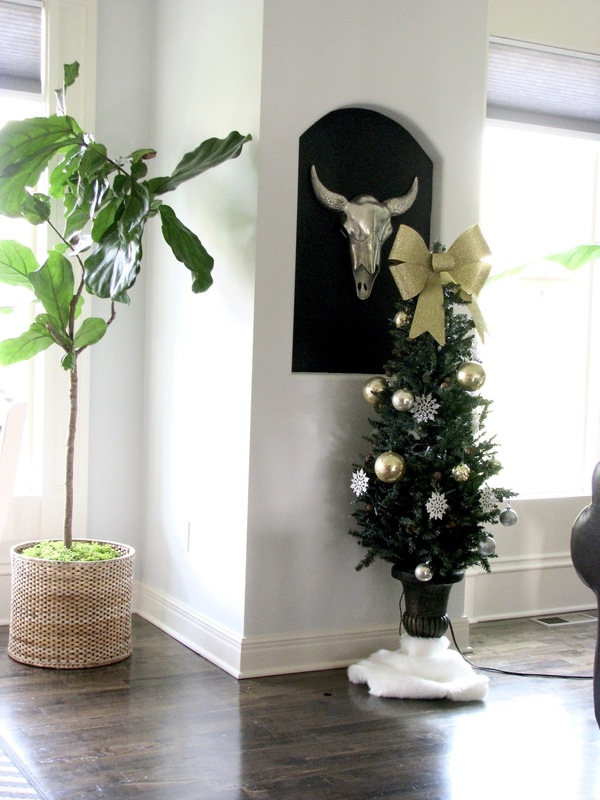 Those container pots were a fun little DIY project this year too! 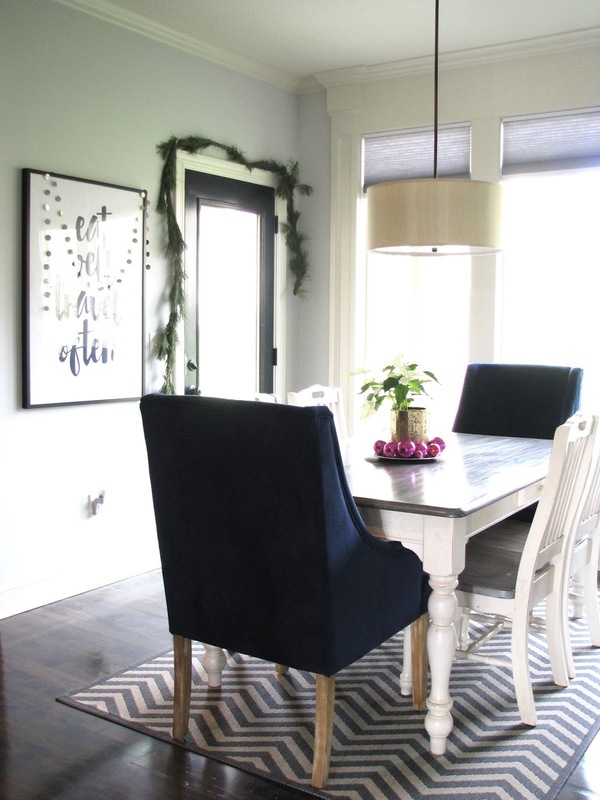 Our dining room is right inside the front door. 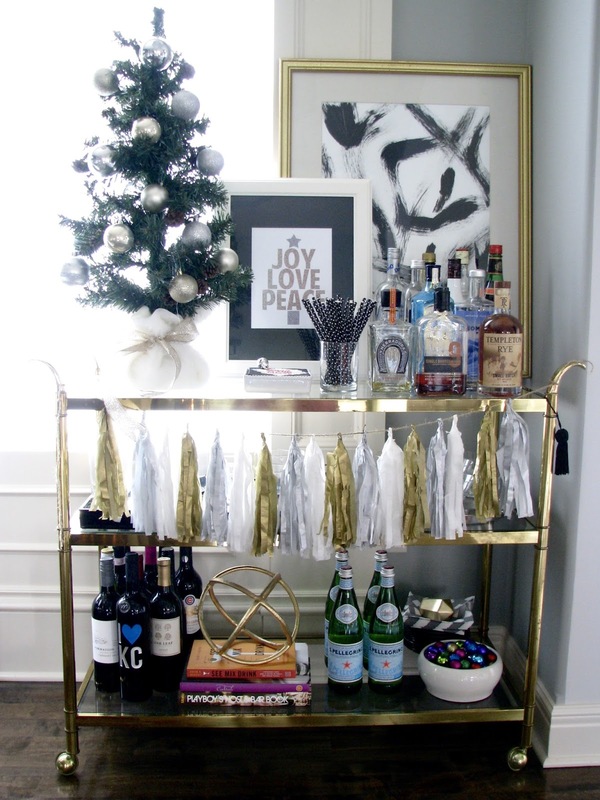 I wanted to keep it simple and classic in here, so I jazzed up the bar cart, added a wreath to the large mirror, and added fresh greens. We have a very open concept first floor, so our tree always finds a home right in between the living room and dining room. From here, it can be seen from every angle and room. We always pick out a real Frasier Fir, and the kids love decorating and pulling out the ornaments. 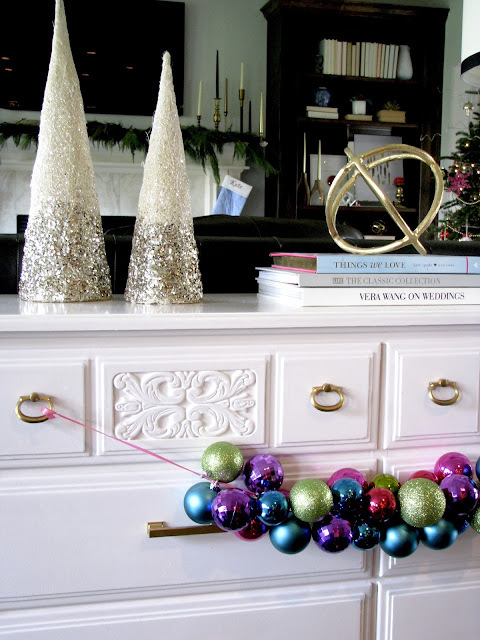 Our tree topper is an inexpensive glitter bow, and our tree skirt is a $13 blanket! 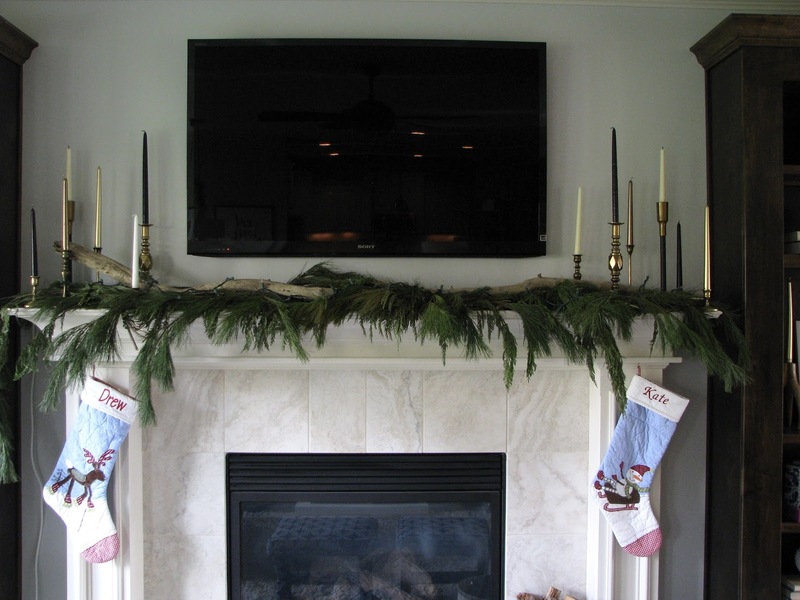 Our living room is very neutral this year with fresh garland on the mantle, mixed metallics, and non-traditional pillows. 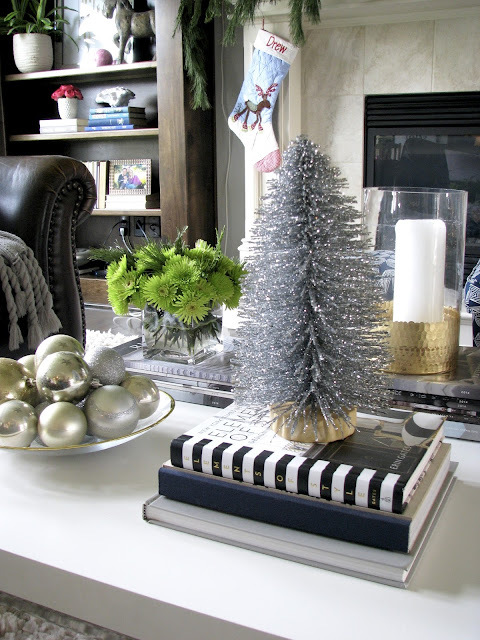 The tree is the shining star in this room, as it should be! More fresh garland, a DIY glitter garland, and a white poinsettia round out our eating area. Fresh plants/flowers/garland never disappoint. 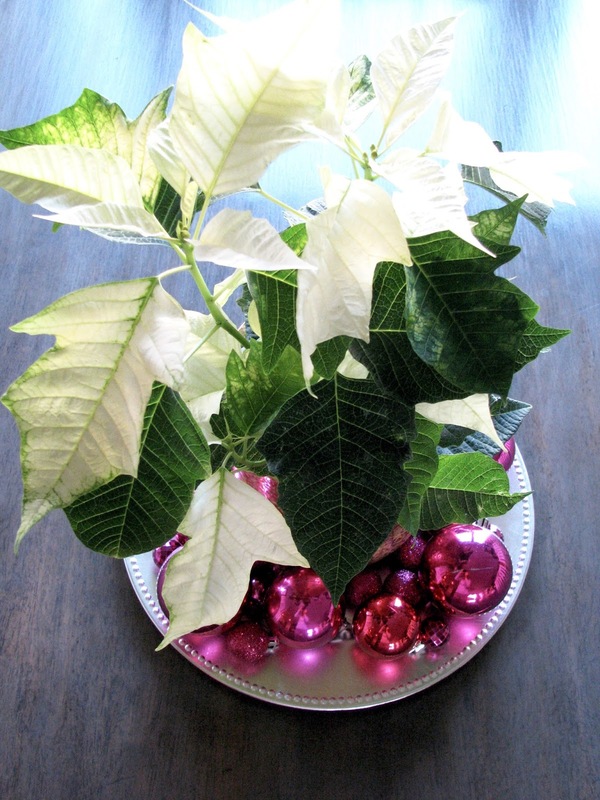 And pink is festive in this house all year long! 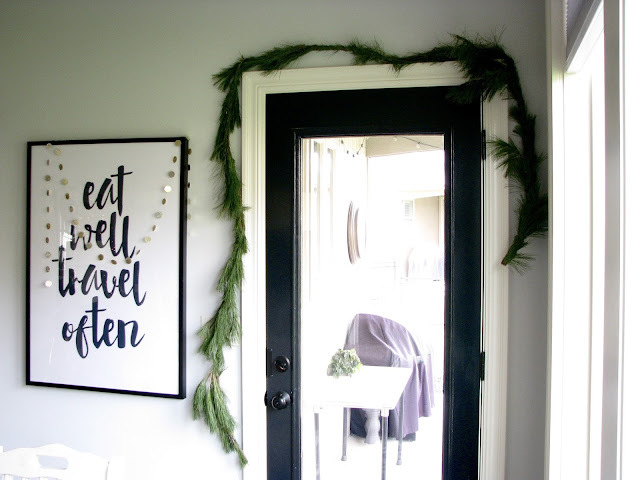 I added a fresh wreath at the kitchen window and decided to display our holiday cards on the pantry this year using pink satin ribbon and clothespins. 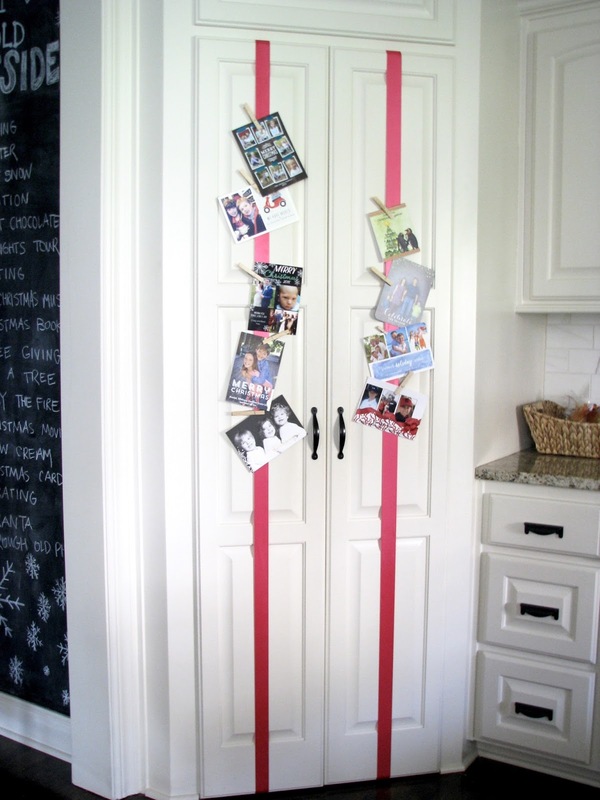 It adds such fun color to the kitchen! You can see our chalk wall peeking out to the left. 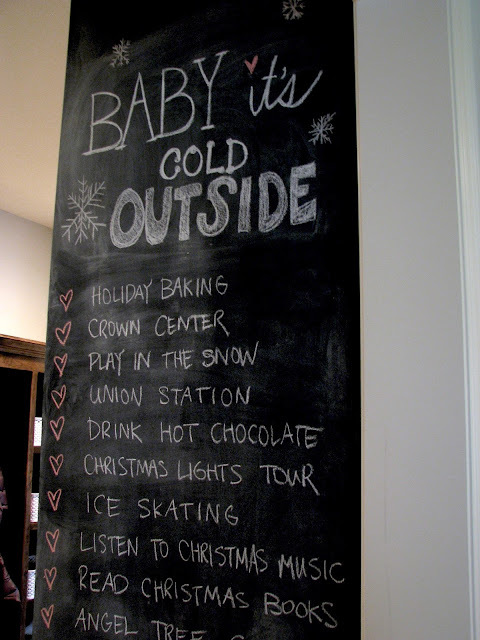 We have made summer and fall bucket lists on our chalkboard, but this is the first year for a winter list. The kids love these and it keeps me from having to change the chalkboard too often! This chalk wall is one of my absolute favorite things in our home...such a fun conversation piece! Thank you for stopping by our home! I hope you are enjoying this time with your family and friends and taking a little time to relax and give yourself a break! Our home has looked different the past two years, so please check those tours out too! I love your use of fresh greens throughout, so pretty and the Tree is definitely the center of attention. Gorgeous tour. 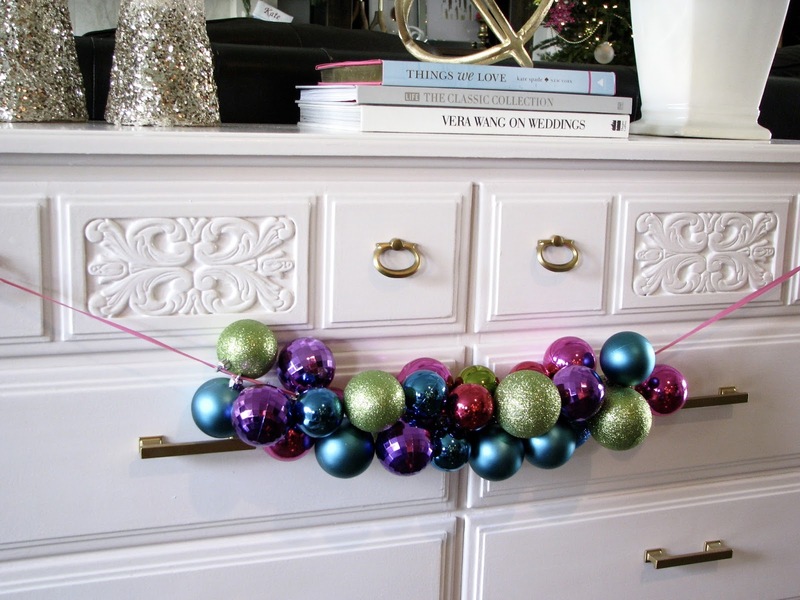 Oh how I adore the ornament garland on the sideboard. I am completely enchanted with your lovely home. May all the joys of the season be yours. 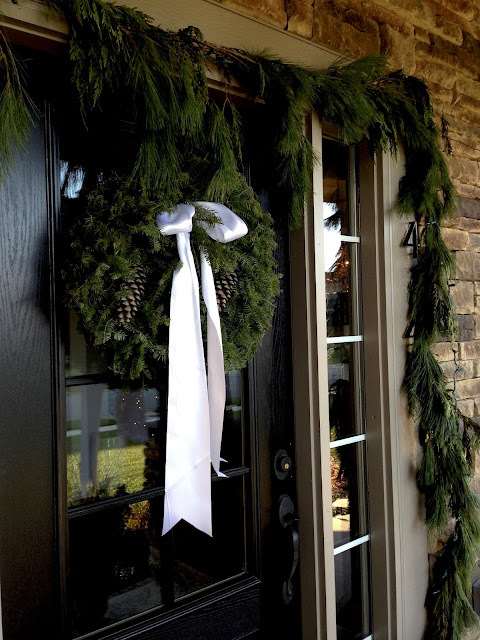 I love your style and your home is beautifully decorated for Christmas! 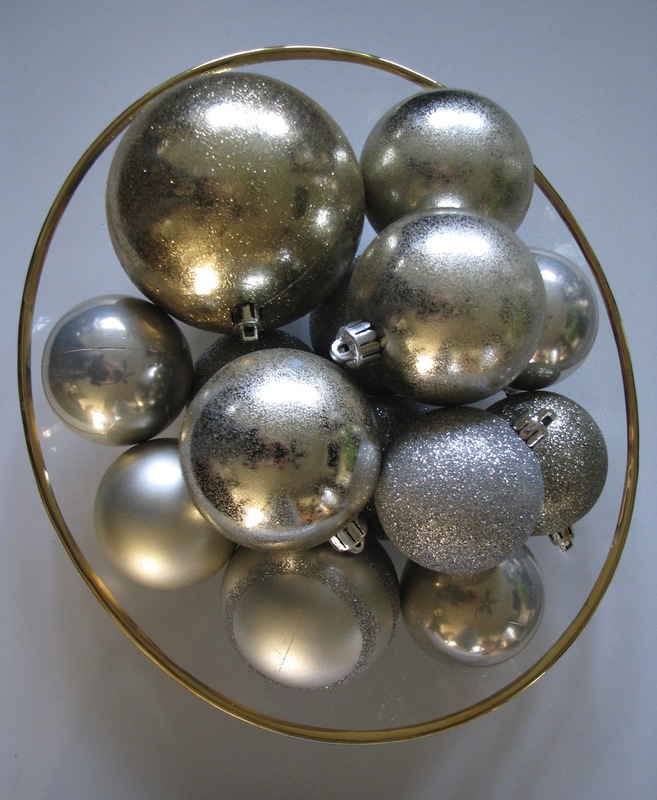 Love how your Christmas decor just pops against your neutral background. Happy Holidays! Such a beautiful tour, Andrea! Lots of fun little details that make everything special. Love your simple Christmas Card display!